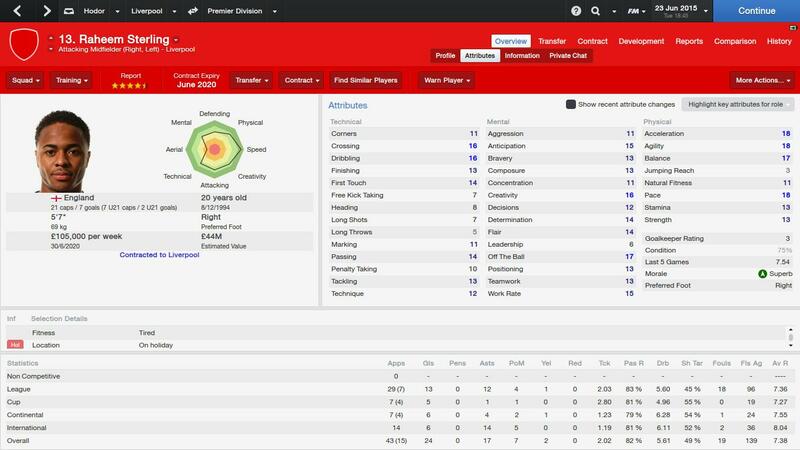 This FM 2014 player profile of Raheem Sterling shows that the Liverpool teenager has a pretty good future in Football Manager 2014. We all know Sterling, his amazing speed and dazzling skills and his FM 2014 profile confirms what we knew about him. He should make a great winger for any team and Liverpool want 15 million for him at the start of the game. He didn’t have the happiest of positions at Liverpool in my test save, they didn’t give him much first team football and ended up offloading him to Spurs for just 3 million. That said, I think he can develop better than the screen shot above shows if given more first team football. He did a good job for England though, 26 caps and 4 goals. Raheem Sterling Age: 18 Position: AMRL Role: winger Club: Liverpool Nationality: English Value: £6 million Price tag: £15 million (in patch 14.3.0) CA: 138 / PA: -9 (between 150-180) Raheem Sterling profile in 2013 (after starting new game, version 14.3.0) Raheem Sterling profile aged 25 in the year 2020 Raheem Sterling career history until 2020 This FM 2014 player profile of Raheem Sterling shows that the Liverpool teenager has a pretty good future in Football Manager 2014. We all know Sterling, his amazing speed and dazzling skills and his FM 2014 profile confirms what we knew about him. He should make a great winger for any team and Liverpool want 15 million for him at the start of the game. He didn't have the happiest of positions at Liverpool in my test save, they didn't give him much first team football and ended up offloading him to Spurs for just 3 million. That said, I think he can develop better than the screen shot above shows if given more first team football. He did a good job for England though, 26 caps and 4 goals. Yep, he should cause lots of problems to opposition full backs. Looks like he got a pretty significant boost in 14.3.0 patch. Check it out! We will check out all the players we have profiled with the new patch.